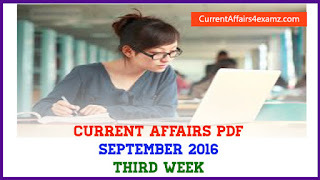 Hi Aspirants, here is the Current Affairs Quiz for 30 August 2016 covering the important happenings for the day. This will be very useful for all upcoming exams. Click the ‘START QUIZ’ button to attempt the quiz with multiple choice options as asked in competitive exams. Just login with your facebook account to begin quiz. Happy Learning. 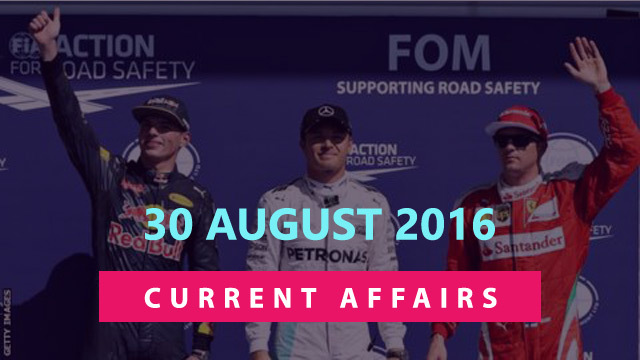 1. Who recently won the 2016 Belgian Grand Prix of Formula One? 2. Prime Minister Narendra Modi on 30 August 2016has launched the first phase of SAUNI (Saurastra Narmada Avataran Irrigation) Yojana in which state? 3. Telangana Legislative Assembly and Legislative Council on 30 August 2016 have unanimously passed a resolution giving their nod to the proposed Amendment to the Constitution to pass the GST. Telangana has become the ___ State/UT to ratify the Bill? 4. Which Olympic medal winner has been appointed as an honorary Commandant of the CRPF on 30 August 2016? 5. West Bengal Assembly has passed a resolution for renaming the state as ‘Bangla’ in Bengali and ___ in English? 6. Indian wrestler Yogeshwar Dutt’s bronze medal in which Olympics has been upgraded to silver on 29 August 2016? 7. Who was recently awarded the prestigious Saraswati Samman for the year 2015? 8. India and the ____ have signed Logistics Exchange Memorandum of Agreement (LEMOA) that will enable both countries to use each other’s bases for repair and replenishment of defence supplies? 9. National Sports Day was observed on? 10. Name the Veteran Sri Lanka batsman who announced his retirement from international cricket on 28 August 2016?